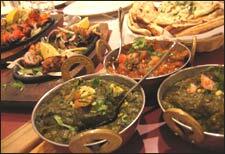 Punjabi Food Festival is an event that took place between 13-Apr-2007 and 22-Apr-2007 in Hyderabad. The cost of clicking above is Rs. 249. For, you'll have no option but to, er, bite. On the occasion of Baisakhi, RV, the dining restaurant of the Celebrity Boutique Hotel at Begumpet, is organising a Punjabi Food Festival, from 13th to 22nd April. At Rs. 249 per head (taxes extra), the buffet has lot to offer. As always, there's the traditional Sarson Ka Saag and Makke Ki Roti. You can try the Saag with the crisp Missi Roti as well. Spicy pindi chole, mouth-melting Dal Makhani and Kadi Kofta are some of the hot favorites. Or bite into the juicy Patiala Shahi Murg or Rarha Meat, or opt for the less spicy Macchi Tariwali. The King of all meals, Dhaba Ka Butter Chicken, rules the menu. Wash off with a Punjabi Kheer, Gajerila, Jalebi or Rabdi. And don't forget to have a glass of Patiala Ke Lassi. For further details contact the restaurant at 6632-9999 or 6626-6665.